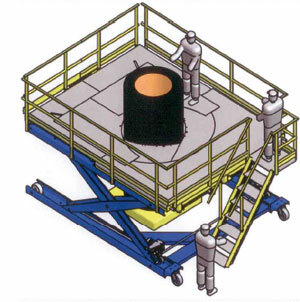 It is a platform lift to assembly phases. It consists of a plinth on which a pantograph lifting system sets in motion with maximum height of 2,90 m. Tread platform consists of a central compartment to IRIS, composed of sectors whose movement is commanded by an electromechanical system opening and closing. The minimum diameter of opening is of 1000 mm and maximum diameter is of 3000 mm. The plan is itself divided into two opening parts for the introduction of the bobbin in the centre of the platform. The platform is equipped with a scale for operator access and is equipped with adjustable steps with landing for entrance to the platform, and a security perimeter railing along the top edge of the platform. The lifting system is electromechanical, powered with panel control at ground and also on board of the platform. The platform can also display a self-propelled wheel system for handling. Platform lifts are accompanied by electrical safety systems as well as mechanical.